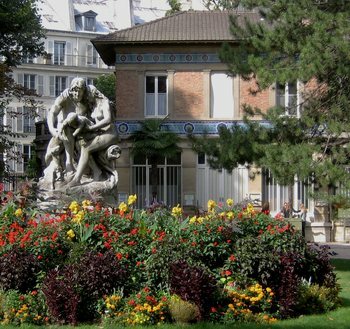 This past weekend, the art of flower arranging was demonstrated in this cute building in the Luxembourg Gardens. 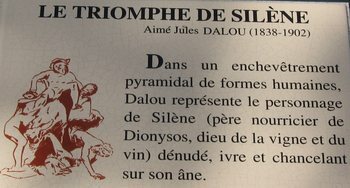 “Le Triomphe de Silène,” a bronze sculpture by Aimé Jules Dalou (1884). This sculptor has to flee from France because “La Commune” wanted to arrest him for political reasons, so he went to live in England for a while. He was made a “Chevalier de la Legion d’Honneur” in 1883. In this confusing pile of people, Silène is raising up a very drunk Bacchus onto his donkey in the middle of one of the Luxembourg’s lovely flowerbeds. Looks like fun. 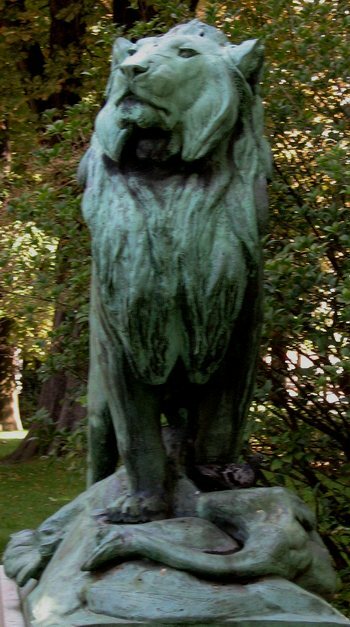 Nubian lion with its prey in the Luxembourg Gardens. 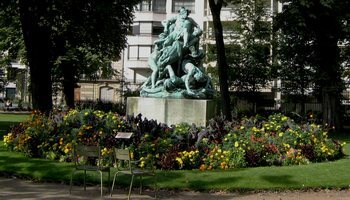 We’ve been taking daily, long, circuitous walks through the Luxembourg Gardens. And we’ve started to love this neighborhood near Saint Sulpice. One of the many differences between this neighborhood and our neighborhood in the 15th arrondissement is that we hear much more English spoken here in the 6th. In fact, we hear more of many languages spoken. It is even more common in shops in the 6th for the clerks to speak English. This is a rather ritzy area, where people seem to be much more highly educated than average (after all, many parts of the University of Paris/Sorbonne are scattered all around this quarter). On Sunday, we took our last long walk (for this summer) on the berges of the Seine, stopping during a rainshower once again at the Six Huit, a restaurant boat on the river right by the side of Notre Dame. There were four young people having drinks there – an Italian couple, and a French couple. Only the two young women were talking, and the language that they had in common was English. The two guys said almost nothing, and I think it was because they didn’t know much English. They looked bored, but the young women were having a great time. The Italian gal spoke excellent English. She must have spent time in the US during high school. She explained to her friend what an American high school prom was like. She learned the hard way. She and a friend, who really didn’t know what a prom was until they went to one, arrived dressed casually in slacks. Nobody had told them that everyone dresses up for a prom – probably because everyone thought everybody knows what a prom is. She laughs about it now, but I bet she was pretty embarrassed at the time. All of this makes me think about the word “prom.” Where does it come from? Probably from the French word “promenade.” And somehow I think it must be related to the minuet – that formal dance in which one looks like one is walking (promener), in a very formal and elegant way. We’ve discovered that Chez Fernand, the restaurant we went to weeks ago on rue Christine, is indeed a part of a small chain. The other Chez Fernand on rue Guisarde is much closer to us, and it is just as good. Then last night we went looking for another part of this little chain, called Boucherie Rouliere, which is not a butcher shop but a restaurant. Somehow we missed it, and we ended up at an Italian place next door to it. The Italian place, the Santa Lucia (rue des Cannettes), was wonderful. A very good sign was that it was filling up with people even before 8PM. This is a superb place to have veal. But in order to get into the restaurants where we want to go without a reservation (who likes to plan ahead? ), we have found ourselves going out to eat a bit earlier than we are used to – say about 7:40 or so. And, in the restaurants here in the 6th, almost all the servers, it seems, speak English (to varying degrees of competency). We still use our French anyway, even if they speak to us in English, because we know it must be exhausting for them to work in an unfamiliar language much of the evening – it takes so much concentration, it is tiring. When we encounter one who is especially good at English, we are always sure to compliment them. We’ll be leaving Paris soon. I hope I will have another opportunity to update this journal before we go.